Want to turn your table into a spooky setting for a Halloween feast? 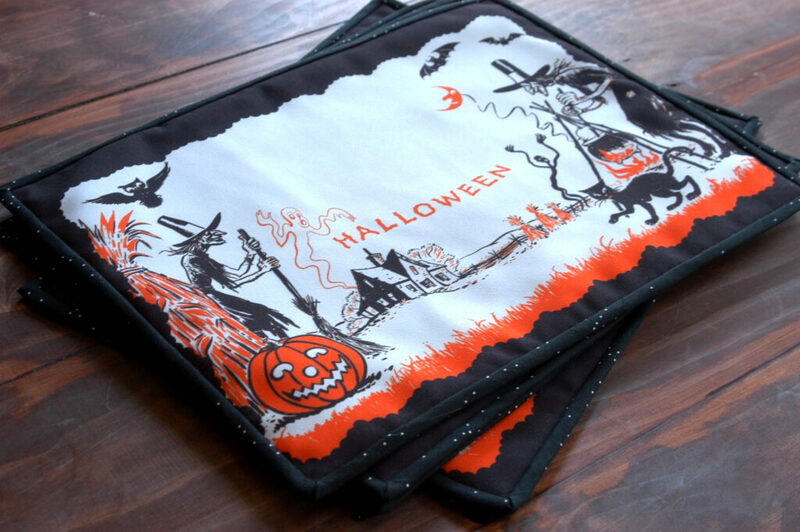 Heidi Kenney (our resident Queen of Halloween) is stopping by the blog today to share the how-to, using her cut-and-sew placemat template available in the Spoonflower Marketplace. Designed to be printed on 54″ wide fabrics (linen would also work), a fat quarter fits two placemats, and a yard gives you eight. Pick a FQ or yard up in Eco Canvas fabric, then follow her easy steps below to sew up these adorable placemats for a table-scape that’s fit for a family of goblins and ghouls! 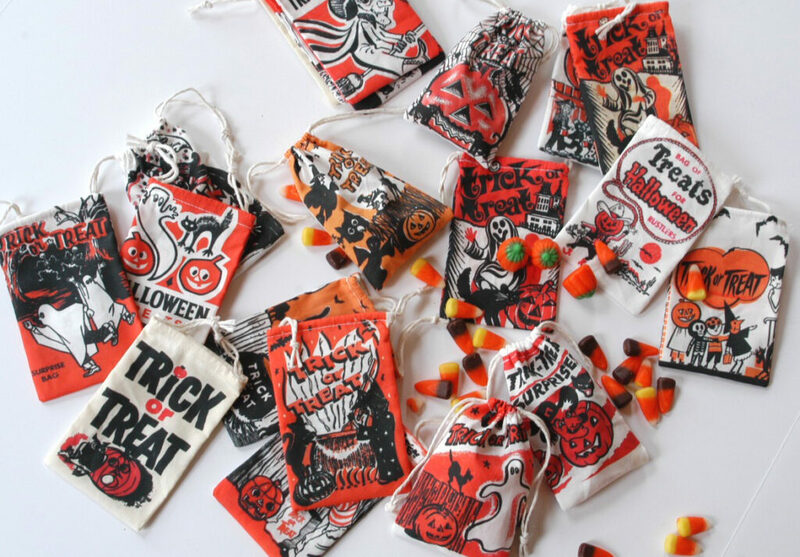 These scary cute vintage Halloween treat bags are a quick cut-and-sew project from the Halloween Queen herself, Heidi Kenney. Heidi’s stopping by the blog today to share the how-to, using her cut-and-sew template available in the Spoonflower Marketplace. 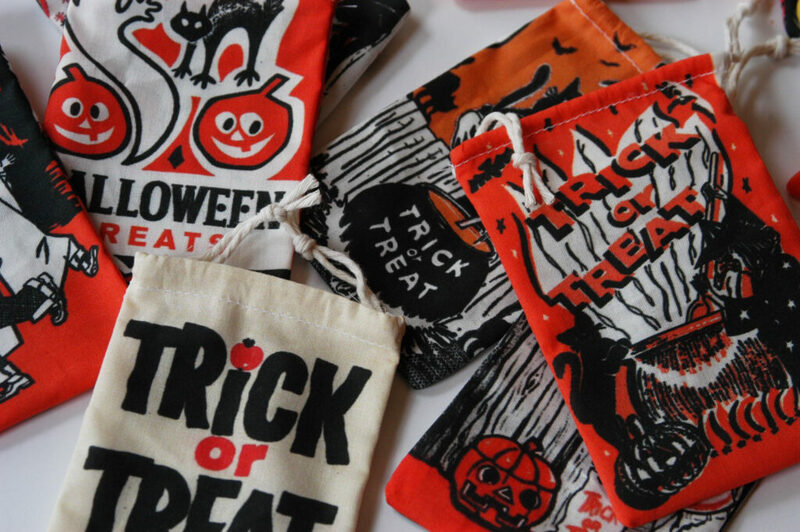 Pick a yard up here in a basic cotton or satin fabric, then follow her easy steps below to sew up these monstrously cute treat bags. They’re perfect for handing out to trick-or-treaters, as favors for Halloween parties, or for your kiddos to pass out to classmates at school. Make any sewing-related New Year's resolutions yet? Many of the Spoonflower staff sure did! 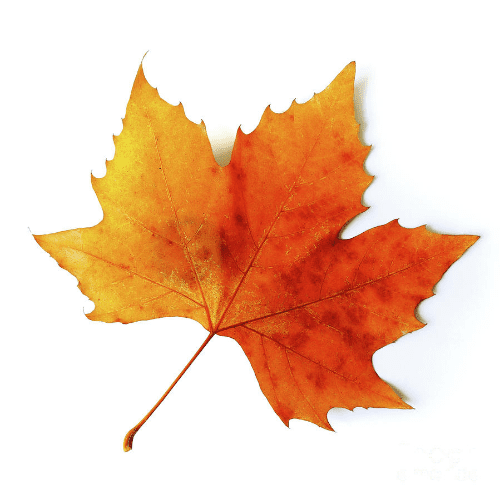 Read on for what we'll be up to this year. Caitlin Topham, fabric procurer: I’m planning on reopening my Etsy shop this year, so I”m working on getting that ready, making new quilts along with other embroidered items like wall hangings, napkins, pin cushions, lots of different things. I also want to turn a few quilt tops hanging around into quilts. Darci Moyers, marketing department: I want to create more for fun and be less perfectionistic about my projects. Stephen Beck, help desk: My first sewing goal this year is to create curtains for my big dining room windows. Also, by this time next year, I fully intend to issue a head-to-head challenge to Gart Davis–and maybe to all the men at Spoonflower–to make a men’s shirt. Jennifer Finan, help desk: I just got a new sofa last night and it’s kind of a dusty rose color. I’d like to make it over with one of our fabrics and make it look less like it belongs in the 1980’s. Allie Tate, operations staff: My resolution is just to find projects to use up my current fabric stash. I have a trunk full of fabric now and I need to start using it! Hollie Anderson, operations manager: I’m going to make at least two bags a week so that I’ll have a lot to sell at a craft fair I'm selling at in the fall. Melodie Moorefield-Wilson, printer: I’d really like to work on tailoring since I just started making my own clothes. When working with patterns, you really need to know how to make them fit you well. Janet Talus, shift captain: I just want to finish curtains for all the windows in my house. If you don’t count my sun room, I have three sets of curtains. If you do, I have three sets plus a whole wall of windows to cover! Caroline Okun, graphic designer: I just bought a sewing machine and I want to learn how to use it. I also want to open an Etsy store and start selling some things that I make. Chad Graves, engineering department: I want to sew a bean bag chair that looks like a Mario brick block. It would have pouches on the side that have a star man and little mushrooms in them. Gart Davis, Spoonflower co-founder: I made a resolution but it’s the same one I made last year and I blew it off. I wanted to sew a garment that I would wear in public. How about you all? Care to share your sewing-related resolutions with us? We promise not to remind you later in the year!